Tuesday to Thursday, I did rough sketches of seven consecutive pages, Friday I did nothing, and today I've decided that pages 4-7 are too rough and need re-sketched. I'm also flummoxed about how to show an aerial battle scene. Also, the comic is going to be much shorter than I originally thought. As a buscraft, the open A5 ring binder is just a bit big- I held it so it was sticking out into the aisle by accident one morning. There's no way to draw or write neatly, but my scribbles are recognizable to me. I'm not sure if I'll ever develop them into tidy drawings, but it would be possible. 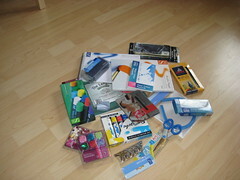 It doesn't look like much, but that's £104 of art supplies and stuff. I'm making a note here, because I'm curious about how long it will take for me to use any of it.